I am a Ph.D. candidate in Analytical Chemistry under the advisory of Professor Gary M. Hieftje. 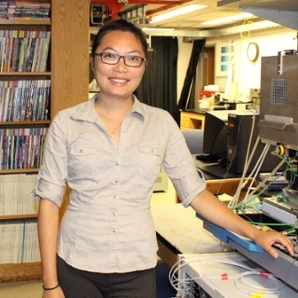 My research involves developing methods to detect and correct matrix interference in Inductively Coupled Plasma Atomic Emission Spectrometry, based on plasma fundamentals. IUB has one of the best analytical chemistry programs in the United States (top 5). The chemistry department in IU is well equipped with instrumentation and glass shops to make research more efficient. In addition, my advisor Professor Gary M. Hieftje is one of the most well-known analytical chemists in spectrochemistry. So choosing to come to IU for my graduate study was not a hard choice to make. I have published two scientific articles in two well-respected analytical journals (Journal of Analytical Atomic Spectrometry and Spectrochimica Acta Part B). I recently received a full-year President's Diversity Dissertation fellowship, a selective, university-wide competition administered by core campus committees. I am also the recipient of Provost's Travel Award for Women in Science. Coming from the bay area of California, I didn't think I would like this small college town, but Bloomington really grows on me. It is small enough that every place I need to go is nearby, but it is diverse enough (food and culture) to get me a big city feeling. I enjoy the large selection of ethnic food places. Moving here with my family, I feel that Bloomington is really a great place for families with good school districts and after school activities (IU Jacob music school youth programs, swim clubs, YMCA, and gymnastic clubs). We also enjoy the outdoor activities in various lakes and state parks nearby with boat rides and hiking trips.